Booking window will be opened from today onward, however, it will be available only for two days before ending on midnight of December 04. With the back-to-back winter sales offer provided by airlines like Jet Airways and Indigo, another low-cost carrier GoAir was also not far away. GoAir today launched a new sale with tagline saying 'Fly Smart, Save Big'. Under this sale, GoAir is offering tickets starting at lowest rate of Rs 999. These tickets can be booked for travel period between December 19, 2018 till January 04, 2019. Hence, GoAir's this offer is exclusively for Christmas and New Year sale. 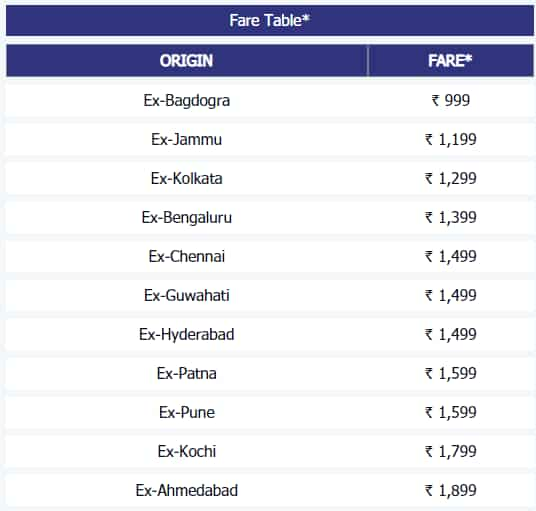 The lowest fare of Rs 999 is for origin Bagdogra. Other destinations included in the sales are - Jammu, Kolkata, Bengaluru, Chennai, Guwahati, Hyderabad, Patna, Pune, Kochi and Ahmedabad. GoAir on its website says, "In 2018, it’s now or never! Best time of the year to book tickets and get going for a smart vacation! Grab lowest fares, starting at Rs. 999*." Hence, the airline adds, So, quit waiting, start packing. And take off to the destination of your choice with GoAir! NEXT STORY: What went wrong with Sun Pharma shares? Shocks investors, plunges 11% as Dilip Shanghvi under scanner; should you invest?